I've forgotten how I met the author of Stick Man on Facebook. But, I've been "friends" of Richard Rossi for a few months now. So, when he said he had a novel out, I decided to take a look at it. It's described as a "coming of age" novel. Not normally my cup of tea. But, I am so glad I picked it up. Once I picked it up, I could hardly put it down because I saw so much of myself in the main character of Jeremiah, so much. The thing that's really weird about me seeing myself in Jeremiah, the young boy who, over the course of the book, becomes a man, is that there is very little about the details of our lives that overlap at all. He was raised in Pittsburgh by an artistic family with a devout Catholic mother and a mentally ill father. Jeremiah endures physical hardships I never had to endure. And there is the issue of just who is Stick Man, a character that haunts Jeremiah's dreams. And, we're not really sure at first, maybe Stick Man is in his waking life as well. 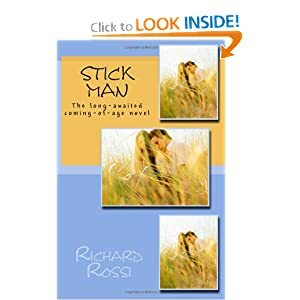 I spent the first part of the book wondering whether Stick Man was a personification of the guilt and shame haunting Jeremiah and just a projection or whether I was reading a Stephen King type novel where Stick Man, a figure made of the sticks of the cross of Christ, with nails for fingernails is an actual physical entity. The answer? Well, you'll have to read the book to find out. That’s when my nightmares started. In church, where we're supposed to go to be comforted, to be reassured, to be loved- that's where little Jeremiah was given the deepest fear he would ever know. That's where his nightmares started. That's where my panic attacks started. I knew as soon as I read this passage this book would be something I could relate to. When I'm reading novels, I don't normally highlight passages. But, I ended up highlighting 61 passages from Stick Man (on my Kindle). It's interesting that Jeremiah was first raised Catholic, then fell in among Pentecostals because so much of the guilt that was pumped into little Jeremiah was almost exactly the same stuff pumped into me, including some the language. "If God were small enough for us to understand, He wouldn't be big enough for us to trust,"
The book follows the life of young Jeremiah from the time he is a young child until he reaches the age of 21. We see the wounds inflicted upon him by the church, his parents and trusted adults. And, we see how he wrestles with the demons haunting him because of the lessons he's taught about how he's never good enough. Then, we watch Jeremiah as he learns to trust himself and to deal with all the pain of his past and as he comes to a new understanding of just who or what God is. I don't know how well people who don't have a fundamentalist past will be able to relate to this book. It's just such a bizarre, nonsensical mindset that many people who haven't been steeped in it simply cannot understand why we didn't just reject it and not let it wound us so deeply. Even my brothers and sisters weren't impacted the way I was. But, like Jeremiah, my parents called me the "sensitive one". As a child, I accepted everything my parents, preachers and Sunday school teachers said. They knew better, they had a direct line to God and God had put them in charge of teaching me how to avoid the hell that seemed to await me at every turn. I wanted nothing more than to escape Stick Man and I was willing to listen to anything that could help me with that. In my experience, those of us raised with a faith tradition take on the faith of our fathers at first. Then we find that faith doesn't fit. In fact, for some of us it not only is uncomfortable, it's choking us to death. Then, we chuck the whole thing away or most of it anyway, until we can find a way to reconstruct it into something that actually works for us. I recommend this book for people who have been scarred by a fundamentalist upbringing or for people trying to understand someone who has been. I don't know how much of the book is autobiographical. But, Rossi writes with the understanding that would seem to only come from someone who has been through the things he writes about. If Rossi is not Jeremiah, he did a great job of understanding the character. The book is PG-13 though containing some strong language and some fairly explicit sexual scenes (with the grown Jeremiah). I wouldn't really say I enjoyed reading the book as it did take me back to some uncomfortable places and feelings I have tried to put behind me. But, as I learned when I was in counseling a few years ago, if we never face those feelings, they never really heal and they haunt us in ways we don't even imagine. To truly defeat Stick Man, you have to face Stick Man. There have been untold numbers of people, in torments literally, worrying about a loved one who isn't "saved." There have been untold numbers of little children who have night terrors because of hearing that God is going to burn people who aren't "good" in fire forever and ever. There are untold numbers of children and adults who have suffered the abuse of these false teachings; emotionally, psychologically, and physically. In fact, all abuse that goes on in the world is rooted in the teachings of a Monster God who makes Hitler look like a Boy Scout. God created no such place as Hell, but men have done a very good job of creating it right here on earth. The scriptures say that the love of money is the root of all evil; and Religion is all about money, and from money comes power; the false teachings (lies) that defame and slander our loving Father keep the people enslaved (in fear), which is by design. When we see God as He really is, LOVE and LIFE, we see a "new heavens and a new earth." "In church, where we're supposed to go to be comforted, to be reassured, to be loved"
Amen to that Brian. Sad that so many religious folks don't do it. Thanks, Rhonda. Please do share it. @Bob- church was, for me, the scariest place on Earth. It's where I learned all about fear and guilt and shame. Growing up Episcopal was a mixed bag Brian but I definitely was never scared by the folks there. Mostly it was a positive experience for me. My wife grew up Catholic. She was taught (at least the way she perceived it) that only the really BIG sins- like murder, put you in Hell. So, she had no fear of it and thought it was a choice you make. G-d didn't send you to Hell, you chose it. I was taught every sin was the same. There were no white lies. A lie is a lie and a lie is the same as murder. A thought was as bad as an action. (If a man has lusted in his heart...) Any unconfessed sin was enough to keep you from heaven because G-d is pure and can stand NO sin, no matter how small. I was constantly reviewing my day to try to think of every sin I might have committed in action, word or thought. "A thought was as bad as an action." Small wonder people with that kind of thinking are quick to act when tempted. Thanks for the book recommendation. It reminds me greatly of my own childhood in the Southern Baptist Church. Like you, church for me was about fear, guilt, and shame. My siblings also were not effected the way I was. Personally, I believe that most people who profess these beliefs do not truly think about them. If you honestly and intensely think about God torturing millions or billions of people for all eternity in hell for the tiniest infractions, it really screws with you. Sammy, thanks for sharing your experience. It always makes me feel a little less of a freak when I find out the doctrine of eternal torture along with the idea of original sin and a need for perfection freaked other people out, too. I didn't understand how people could sleep at night with that hanging over their heads. Had I been told that before I was born and had the choice, I would never have taken the risk to be born. Sounds like a good book, though it definitely doesn't mirror my experience. Most of my time as a Christian was very positive, at least in the way I was treated. Any toxicity came more from my own interpretations of scripture and from various theologies that I believed in.